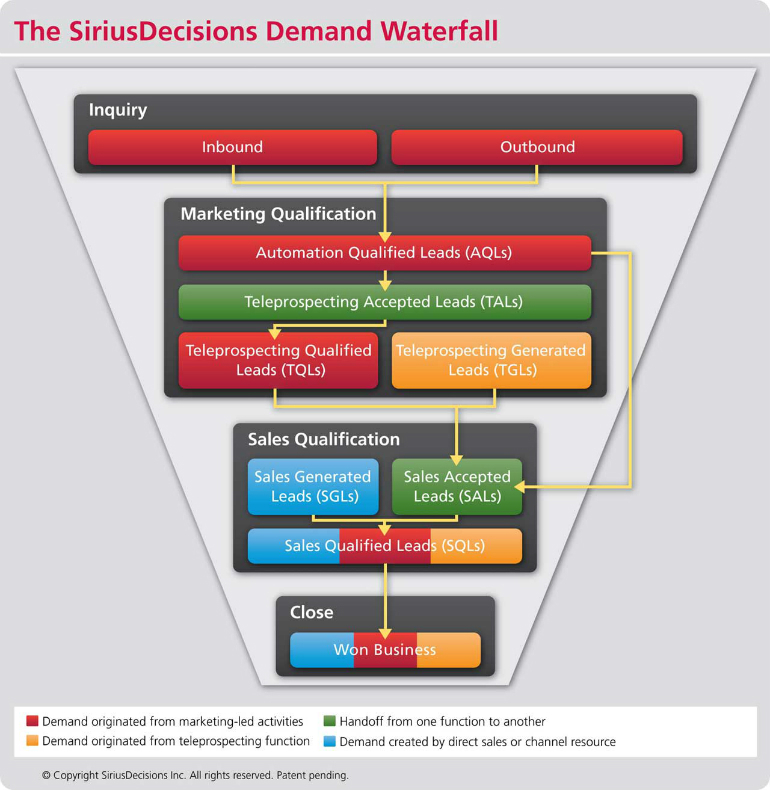 Launched in 2002, and revised in 2012, the SiriusDecisions Demand Waterfall has become the de facto standard for managing demand generation processes. In this 2-part article, Jeff Wright, VP, Product Development, at MarketOne explains how it works and why it is so useful. When SiriusDecisions unveiled the ‘rearchitected’ version of their Demand Waterfall in 2012, it was clear that it had become a sophisticated and mature framework that logically arranged all the elements that marketers need to coordinate in order to optimize their demand generation efforts. To me, there were three areas that I found most interesting, and explaining these points will help you to understand just why the Demand Waterfall is so widely used. I have explained the first point below, the second and third points are covered in Part 2 of this article. Sales and marketing teams have been teleprospecting for decades. Before email it was considered the low-cost channel to reach a broader base of prospects and customers with your message and try to source more qualified leads for sales. At some point, every organization has used some flavor of teleprospecting to drive leads into the funnel. Automation Qualified Leads (AQL) as Sirius defined it, is the use of marketing automation to score inquires to determine which ones are ready for the next step in the qualification – teleprospecting. I would also add that education-oriented nurture streams should be tightly aligned to this stage as those inquiries that do not score high enough to move to teleprospecting should be automatically routed for further education and then allowed to trickle through your AQL gate. Teleprospecting Accepted Leads (TAL) is when a dedicated teleprospecting team evaluates the AQL and makes a decision to accept or reject it. What will be in debate here is whether a visual inspection of the AQL is enough or whether companies will require at least one successful call attempt– i.e. was there enough data provided and was the data “true” enough to make a valid tele-connection. The only way to find that out do that is to pick up the phone and at minimum reach the prospects admin, voicemail or have the main switchboard verify the information. Teleprospecting Qualified Leads (TQL). What I think will be interesting here is that companies like MarketOne, who have been doing teleprospecting for more than a decade, understand several key drivers to hitting a target metric for a TQL. For example there are large increases in conversion from sweep 1 to sweep 3 of a database – but once you move to sweep 4+ you get a rapidly diminished return on the effort. Companies will need to be okay with pulling up the fishing poles and moving to another fishing hole. The timing of the calls is also important – you need a team that can manage the call cycles over the right timeline. Making call sweeps too close together will not allow the voice mail to germinate – on the flip side too much time between calls will negate any recency of activity. That leads to the next key factor – the voice mail. It needs to be aligned and focused on the respondent’s area of interest at the time they enter the teleprospecting phase. This is why Sirius emphasizes the teleprospecting team needs to be a function of marketing not sales, and they need to play by their own set of metrics – not just pipeline revenue and overall revenue. Teleprospecting Generated Leads (TGL) – is, in my opinion, the hardest part to govern for a centralized team. Once the word gets out that the team is making outbound cold calls – the requests inevitably come in from field marketing, field sales, partner marketing/sales and product marketing. This is even harder for teams that are in-sourced to manage, as the mentality of “it is free” to run my call program through this team will emerge. (Might be more reason to outsource this group to help protect bandwidth). The trick is prioritizing activities, and that is typically based on how you measure and compensate the team. So make sure you have some flexibility and don’t align all KPIs to immediate pipeline. Overall, this part of the teleprospecting methodology needs to have alignment with the field i.e. there needs to be a set of accounts pre-vetted by sales/field marketing for the team to attack ad-hoc. This allows the teleprospecting team to transition from inbound to outbound calling on the fly and not require batch marketing list load to keep them busy. There also needs to be additional metrics aligned to this – i.e. name development, event registrations and nurture generation metrics to go along with pipeline generation. Expectations need to be set with the field that it’s going to take months, maybe even over a year before an opportunity emerges within these accounts. When it does, there needs to be an expectation that it may bounce between sales and marketing for a few months as the prospect tries to align internal teams to the opportunity. Finally, you need to consider how to handle referrals – are they part of TQL or TGL? It will require some time to think about the design of the workflow and how the tele-team “treats” new names they generate overall. The Demand Waterfall requires us not only to use a scoring model to determine which leads are qualified (and more importantly which are not) but also to not be afraid to use the teleprospecting team to A/B test scoring scenarios. The idea is that even though you score leads you still need to have a teleprospecting process evaluating and converting leads for sales. The alignment of teleprospecting with scoring can be a critical operational alignment to identify early in the campaign lifecycle whether you are trending towards a potential successful campaign or not. Because marketing has a team at the ready to accept and reject the leads that pass the scoring threshold and also have source code information attached to it – you can begin to understand in days/weeks what channels are gaining traction and whether or not you are evaluating those channels with the right scoring model. This allows marketing to adjust campaign configuration early and often, which ensures you provide sales with a high value product and don’t bog them down with potentially poor performing campaign results. But there can be problems. We have worked with several clients to align marketing and sales, setting up a lead management workflow that fed leads into Eloqua, scored them, and then passed only qualified leads to inside sales in Salesforce.com. The problem was that some clients tried to leverage an existing inside sales team that was not 100% dedicated to lead qualification. These teams only did the qualification part time, which resulted in less than 100% compliance with the new workflow. While we did validate that scored leads convert at a higher rate – what we were not able to achieve was the analysis of the scoring model and early campaign success indicators, since there still was a “cherry picking” mentality in place. In addition to the inconsistent compliance to the workflow, there was also no follow-up by the marketing team on the model. MarketOne handed off the model, even supported some of the training material – but once the workflow was live, the client took delivery of the process and parted ways with our consulting team. We consistently went back in to understand KPIs – but it was clear that the marketing teams were struggling with sales compliance and had moved on to the next big marketing idea and never really validated the program success beyond the top line MQL generation number. What companies need to consider is staffing a dedicated tele-team under marketing that can both manage the inbound workflow and outbound activities that align with account based marketing, event marketing, channel, product marketing etc. Also, as suggested earlier – think about outsourcing this team so that it does not look like a place to do “free” calling. MarketOne has applied the theory of the SiriusDecisions Demand Waterfall to the everyday practice of demand generation for many clients. Every challenge is different, but we find it an excellent framework which has generated results time and time again. To learn more about the Demand Waterfall and how you can apply it to your own marketing programs, get in touch.